A 14-year-old and 16-year old were killed March 20 when the car they were in crashed into a Broadmoor beauty salon and supply store, setting it on fire after New Orleans police say the car’s driver evaded a traffic stop, authorities said. The Orleans Parish Coroner’s Office on Wednesday (April 3) identified the deceased teens as Byron Wilson Jr., 16, and Chimelu Collins, 14. Coroner Dwight McKenna’s office said the boys died of thermal injuries. A 54-year-old woman, Schwann Hebert, who NOPD has said was getting her hair styled at the Unity 1 Beauty Supply & Hair Salon when the crash sparked a three-alarm fire, died the following day, on March 21, the coroner previously said. Six others, including two NOPD officers, were hospitalized for smoke inhalation, the New Orleans Fire Department said. At least two other people who escaped the burning building refused treatment at the scene at Washington Avenue and South White Street. 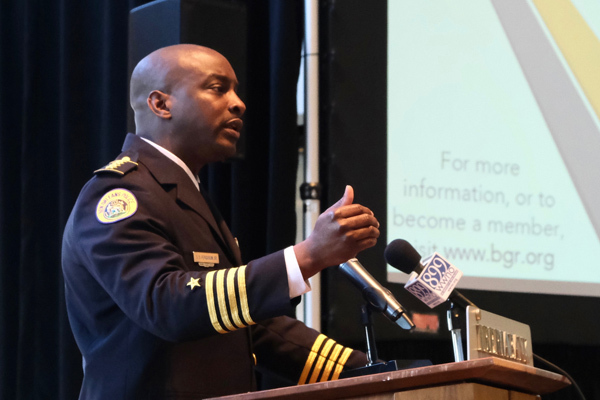 New Orleans Police Department Superintendent Shaun Ferguson said the day after the crash and fire that NOPD’s Public Integrity Bureau opened an investigation into a possible violation of the department’s vehicle pursuit policy relative to the action officers took prior to the crash. NOPD has said the car that crashed into the salon was stolen, and the officers sought to pull it over a few blocks away from the location of the salon and beauty shop. The car refused to stop and accelerated, and internal investigators are probing if officers chased it. The NOPD’s vehicle pursuit policy, which was updated in December 2015 with input from the U.S. Department of Justice and federal consent decree monitors, is on the restrictive side compared to some other police departments: It permits officers to chase offenders in vehicles only if the person is suspected of having just committed a violent felony. Auto theft, possession of stolen property or unauthorized use of a vehicle would not have met the criteria for an authorized car chase. Bystanders at the scene told reporters more than one police car appeared to be chasing the fleeing vehicle that eventually crashed into the salon. Ferguson said March 20 officers “disengaged” at some point, but then said the following day that the department received information to merit a formal investigation into a potential violation of their chase policy. Prior to the release of Ferguson’s statement on the internal investigation, WVUE – Fox 8 released surveillance video that appeared to show police cars following behind a fast-moving sedan in the Broadmoor area just before the crash. The salon and beauty shop, which John and Beverly Smith owned and ran for 38 years, was destroyed. Beverly Smith said Tuesday the couple plan to rebuild. Broadmoor residents said the business employed and served many people in the neighborhood. Broadmoor neighbors spoke March 21 about the teens who died in the car, before they had been officially identified by authorities. Randon Dusty, who grew up getting his haircut at Unity 1 store and salon, said he knew Wilson from the neighborhood and considered him “a good dude.” He said he believed Wilson was raised by his grandparents and expressed condolences to them. “It really caught me by surprise,” said the man, who asked not to be identified, of the circumstances of their deaths. Ferguson told an audience at a March 27 Bureau of Governmental Research Breakfast Briefing that he had met with a parent of the teens killed in the crash and fire. He assured the audience he would be as transparent as he could throughout and after the internal investigation.